There’s a lot going on in York at the moment. In an exclusive interview, council leader Ian Gillies talks to STEPHEN LEWIS from York Press about the ‘state of the city’. He discusses PROGRESS on York Central, on the York local plan, on finding a new use for the Castle car park – and even on the community stadium. It’s all happening in York at the moment. London rents on newly let homes (i.e. homes advertised on the open market to let) fell for the third consecutive month, down -0.8% year-on-year, despite 21% fewer homes available to rent than last year. Whilst in contrast, rents on newly let homes in Great Britain excluding London, rose 2.0% year-on-year, including growth of 1.7% growth in Northern regions. Whilst rents on properties where tenants renewed their rental agreement in London are more robust which increased by 3.2% year-on-year, the North is also showing strong propsects with a growth in rental value of renewed tenancies reaching 2.3% against a national average of 2.8%. “Despite low stock levels, rents on newly let properties (i.e. homes advertised on the open market to let) fell in London for the third consecutive month. Moving is costly for both tenant and landlord. In a period of uncertainty, where tenants’ incomes and landlords’ yields are squeezed, more tenancies are being renewed. “With affordability stretched and less choice available on the open-market, more tenants are choosing to stay put. And with landlord yields under pressure from high property prices and tax changes, fewer landlords want to run the risk of looking for a new tenant and suffering void periods. Rental growth on newly let homes (i.e. homes advertised on the open market to let) picked up to 1.0% across Great Britain, in comparison to 1.7% year-on-year rise in the Northern regions. (see Chart 1). However, London rents on newly let homes fell for the third consecutive month, down -0.8% year-on-year. The capital remains the only region across the UK where rents are falling whilst the North is one of the top four regions in terms of rental growth on newly let homes. Across Great Britain, rents on new lets excluding London, rose to 2.0% in August, the strongest growth in nine months (see Table 1). Newly let rents are falling in London despite stock levels continuing to decrease. This is because, since April 2016 when the stamp duty surcharge on second homes was introduced, landlords have sold considerably more buy-to-let homes than they’ve purchased. So far this year, there were 6% fewer homes available to rent in Great Britain than at the same period last year. But in London stock levels were down 21%. Across Great Britain the average rent of a new let rose to £975 pcm in August 2018 (Table 1). 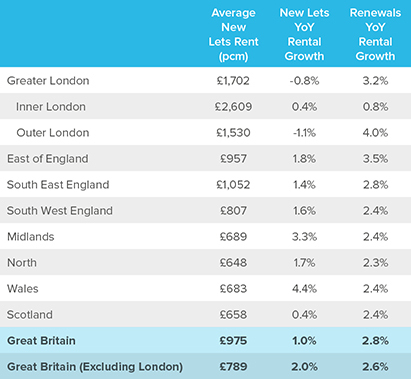 The Midlands and Wales saw the strongest rental growth with rents on new lets up 3.3% year-on-year and 4.4% respectively, followed by the East and North of England (Table 1). Over August, inner London rents picked up for the first time in six months (0.4%), while rents in outer London continued to fall (-1.1%). Rents on renewed tenancies (where tenants chose to stay put, rather than move) remain robust. 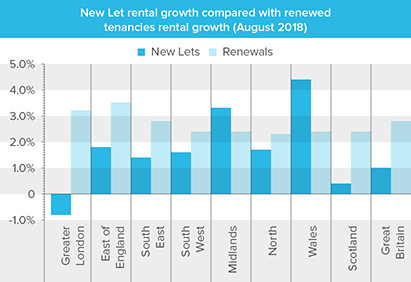 In August there were 2.5% more tenancies renewing across Great Britain than last year, which means that rental growth on renewed tenancies has risen 2.8%, the highest level in 10 months. 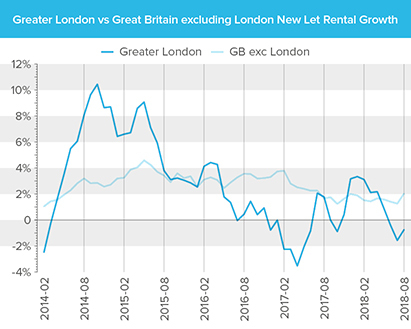 Renewal rents in London have risen for the last three months, reaching 3.2% year-on-year in August, despite rents on new lets in the capital falling (Chart 2). In fact, London has seen the second strongest renewals rental growth across the country, albeit landlords letting out new rental properties in other regions seem to be in a better position than those investing in London. With less stock available on the open market to choose from, particularly in the capital, more tenants are choosing to renew their current tenancies than move on. In London, the number of tenancy renewals has risen 3.7% so far this year compared with the same period in 2017.